Citrus Biopolymers are rarely used in the field of material development up to the present and can be extracted from the peels, which are a leftover from the food industry. Consequently, there is no conflict between food supply and food cultivation, what is very important in my eyes. On the contrary, the peels are already used to extract biopolymers such as pectin and consequently already available. The infrastructure is already established to use this material. 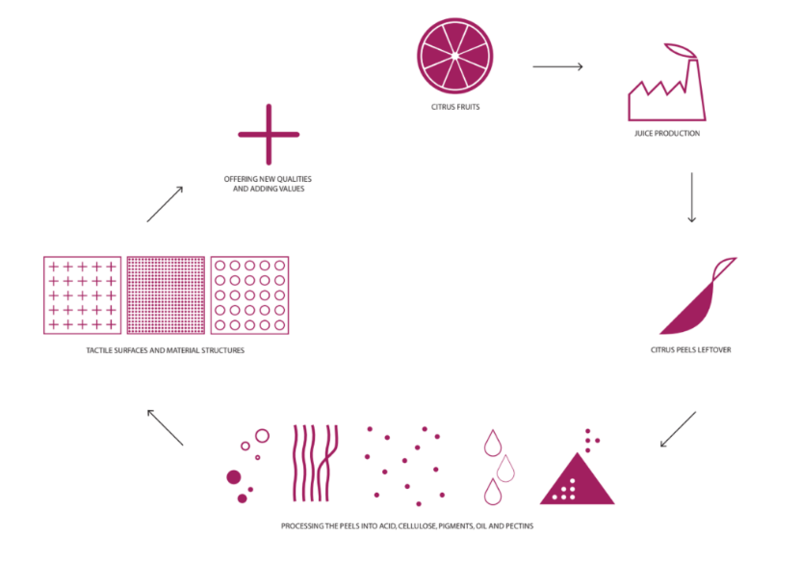 The peels containing various biopolymers what makes its application even more interesting. The material is biodegradable and has a low environmental impact. It can be dissolved completely after it is used. Moreover, this material offers a lot more qualities, especially the tactile qualities are interesting regarding bioplastics. This is an important aspect when we talking about chances and values of this biomaterials to apply it in a material circle on the market. My research is still ongoing. It offers a lot of interesting perspectives to work on. It could be an alternative to conventional plastic packagings. For sure it is helpful to work together with producers, scientists, and engineers to develop it further and going deeper into the process. A designer can offer a creative input to nearly any development, regarding it as an open task. Often a change of perspective is very helpful to improve an idea. As designers, we are regarding the whole circle and not just a very little part of it. In the field of materials, we should think about “new qualities” offered by biopolymers instead of just replacing solutions. They need new applications and newly designed values. Creatives can analyze the whole situation, finding leaks in the circle and develop ideas, together with other experts, to put all together in the circular economy.